CENTER REVIEW 74 • SHOPPING CENTER BUSINESS • May 2018 T here is plenty of folk wisdom out there delivering the same basic message: if something is working, don't change it. That stick-to-the-status- quo approach won't work in the compet- itive and fast-changing world of retail and mixed-use development. Shifting consum- er preferences, and an industry in a state of flux, have created circumstances where mixed-use developments have to evolve to stay relevant and maintain commercial momentum. The most successful retail and mixed- use destinations have a formula that works for them — but they also recognize that formula needs to evolve as it inte- grates new ideas and adjusts along with consumer preferences. There are few places where that level of adaptability and sustained success are on display more clearly than at Easton Town Center, the genre-defining town center development in Columbus, Ohio, that is fast approach- ing its 20th anniversary. Far from resting on its laurels, Easton is constantly evolving. 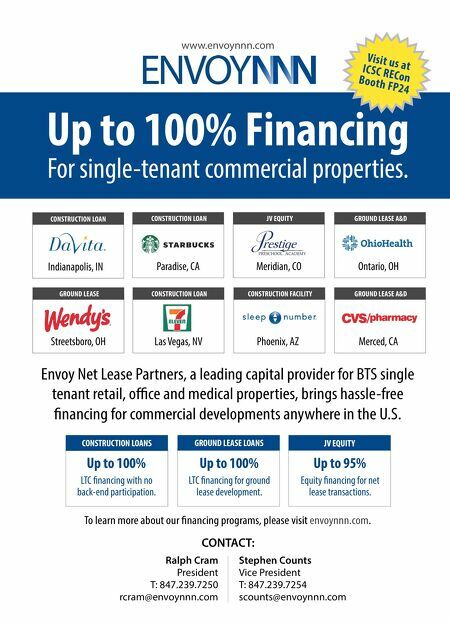 This groundbreaking project continues to break new ground with signature new tenants, award-win- ning expansions and major renovations to existing components. This pattern of expansion and improvement is nothing new: Easton has been adding new piec- es and continuing to evolve and improve ever since it first opened its doors in June 1999. The Easton Gateway expansion serves as a great example of this evolution, as it is very different from Easton's original offerings. While Easton Gateway shares many of the same architectural features and inspired design elements, the con- verted-industrial-warehouse concept that accommodates big box and high-end con- venience retail is a clear departure from the Main Street-style retail of Easton's original street grid layout. The ongoing evolution of Easton — in- cluding its ability to deliver new and in- novative retail concepts, appealing new amenities, creative and engaging pro- gramming, and entirely new uses — is a remarkable testament to how one of the first town centers of its kind continues to push the envelope. INNOVATION To understand Easton, it is best to look at its beginning. Co-developed by Steiner + Associates, The Georgetown Company and L Brands, Easton Town Center was the definition of a game-changer. Easton was the first of its kind, a project that pushed the envelope with thematic and aesthetic innovations, visionary design concepts, and its ability to bring together exceptional retail in a compelling experi- ential context. The Easton master plan reflects an understanding of and appreci- ation for the power (and value) of public spaces along with non-traditional anchors such as restaurants and entertainment. From pedestrian-friendly streetscapes, abundant green space and open air gath- ering spaces, to interactive fountains and award-winning landscaping, Easton has always understood that creating great spaces is a prerequisite for developing great places. That atmospheric distinction comple- ments the density and connectivity of the built environment. This provides a backdrop where visitors who are drawn to the impressive tenant roster find it easy to spend more time and money. 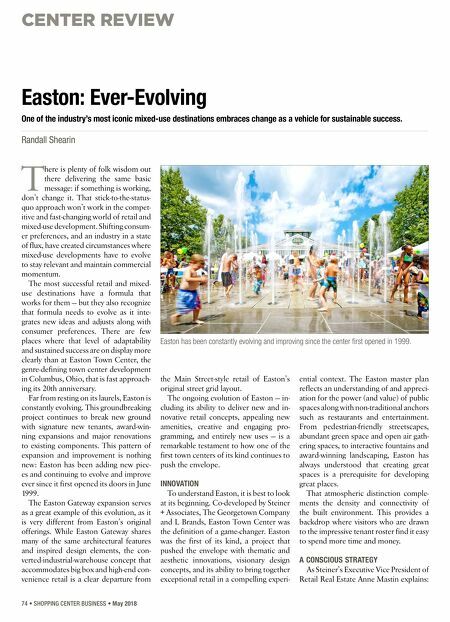 A CONSCIOUS STRATEGY As Steiner's Executive Vice President of Retail Real Estate Anne Mastin explains: Easton: Ever-Evolving One of the industry's most iconic mixed-use destinations embraces change as a vehicle for sustainable success. Randall Shearin Easton has been constantly evolving and improving since the center first opened in 1999.